The game began with Seaver taking control from the first pitch. Jose Arcia, the San Diego leadoff batter, flied out to center field. Seaver struck out the next two batters, Van Kelly and Cito Gaston, to close out the top of the first. In the bottom of the first inning, the Mets jumped out to the lead. Bud Harrelson singled, and when Ken Boswell doubledto the left-field corner, the speedy Harrelson scored when Al Ferrara did not field the ball quickly. The Padres tied the game in the top of the second, Ferrara, when the cleanup batter, led off with a towering home run over the left-field fence. To many in the crowd it was not a vintage Seaver performance so far.3 After giving up the home run, Seaver got Nate Colbert to hit a foul pop to first baseman Art Shamsky. Then Dave Campbell lined out to left field, and Seaver struck out Jerry Morales for the third out and his third strikeout of the game. Seaver continued his dominance in the third inning as he collected two more strikeouts. After walking Bob Barton to start the inning, he struck out Mike Corkins and Kelly. Neither even swung at the third strike. Seaver now had five strikeouts and he was just warming up. The Mets went ahead in the bottom of the third inning. Tommie Agee led off with a single and Harrelson hit a triple to right field that barely missed going out of the park. Agee scored and the Mets had the lead. Seaver had all the runs he would need. Gaston led off the Padres’ fourth and struck out looking. Ferrara walked. Colbert flied out to center field.Campbell singled to left, but Seaver finished the inning by striking out Morales on a fastball. He now had seven whiffs. Seaver continued to befuddle the Padres in the fifth inning. Barton fanned and Corkins was caught looking. The third out was a grounder to third base. By the top of the sixth inning, Seaver had yielded just two hits and had nine strikeouts. Since the Mets led by only one run, he would really have to bear down to ensure that they kept the lead.4 After catcher Jerry Grote caught a foul popup, Seaver got Gaston to fly out to right field, then struck out Ferrara to end the inning and get his 10th strike out of the game. By now the afternoon shadows were starting to creep over home plate.The rest of Shea Stadium was still in the bright sun and the shade around home plate presented problems for the Padres hitters.5 They were flailing at Seaver’s fastball and things would not improve as he showed no signs of slowing down. After Barton struck out looking to lead off the eighth inning, Ramon Webster pinch-hit for pitcher Corkins and struck out. Next, Ivan Murrell pinch-hit for shortstop Arcia, and he was quickly dispatched by Seaver. With just one inning left, Seaver had 16 strikeouts. When the Padres came to bat in the top of the ninth inning, Seaver and the Mets were still holding on to a one-run lead. As Seaver took the mound, the crowd was excited and there was a buzz throughout the stands. When Kelly led off and struck out swinging for Seaver’s eighth strikeout in a row, the crowd made it sound as if Shea Stadium was filled to capacity.7Seaver then caught Gaston on a called third strike for the second out. Ferrara, who had homered for the Padres’ only run, now came to the plate. Ferrara said after the game: “The last time up,it was his best shot against my best shot.He challenged me and he won.”8Seaver struck out Ferrara for his 19th strikeout of the game and his 10th in a row. Seaver’s record of 19 strikeouts for a nine-inning game would stand for 16 years until Roger Clemens struck out 20 batters during the 1986 season. 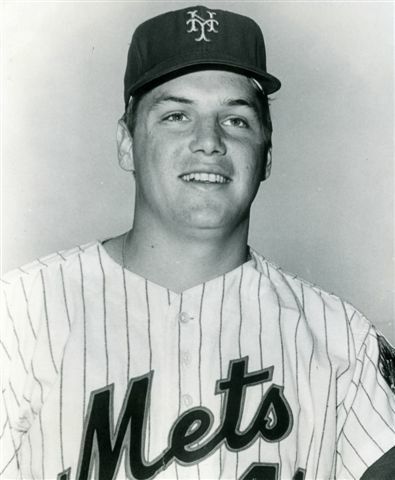 Seaver’s record of striking out 10 in a row still stood as of 2016 as the major-league record. In addition to the sources cited in the Notes, the Author also used the Baseball-Reference.com, Baseball-Almanac.com, and Retrosheet.org websites. 1 Joe Gergen, “Tom Terrific: Seaver strikes out 19,” Newsday (Long Island, New York), April 22, 1970. 2 “Remembering Mets History (1970) Tom Seaver Ties MLB Record With 19 Strikeouts in a Game,” Centerfieldmaz.com, April 21, 2016. 4 Stephen Hanks, “Tom Seaver’s 19-Strikeout Classic Turns 45,” Mets Merized Online.com, April 22, 2015.